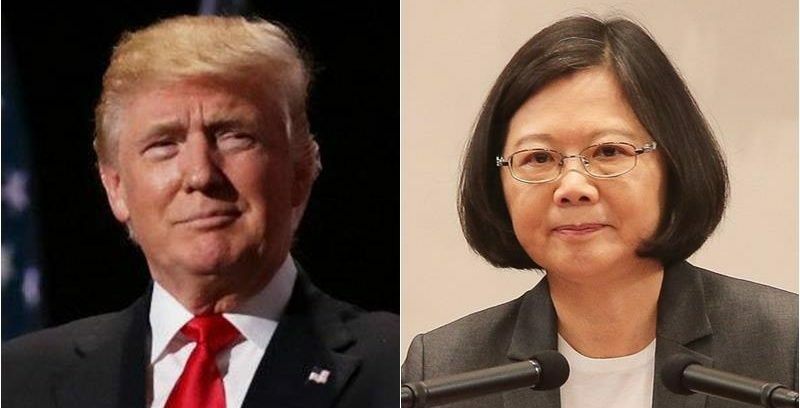 U.S. President-elect Donald Trump and Taiwan's president, Tsai Ing-Wen. Photo credit: Taiwan's Central News Agency. Donald Trump, the next president of the United States, surprised Taiwanese on Dec. 2, when he tweeted about a congratulatory phone call he'd received from Taiwan's president, Tsai Ing-Wen. Due to the “one China” policy in diplomacy, Taiwan has been isolated from the international scene for decades, at least officially. After Trump's tweet, the number of Google searches for “Taiwan” spiked worldwide, tripling in some places. Furthermore, for many people around the globe, Trump's decision to refer to Tsai as “the President of Taiwan” signals American recognition of Taiwan as an independent democratic country. I don't know why we have to be bound by a “one China” policy, unless we make a deal with China having to do with other things, including trade. This, again, surprised Taiwanese. For decades Beijing has used the “one China ” policy to break other countries’ official ties to the Taiwanese government while they want to establish diplomatic relations with the People's Republic of China. Netizens in Taiwan expressed concerns that President-elect Trump is only using their country as a negotiating chip with China, but some say the next U.S. president's scheme could give Taiwan the opportunity to improve its standing internationally. Some Taiwanese netizens complained about being bullied by the international community, following the response of the outgoing Obama administration  and the world mass media to the tweet, which warned that Beijing would be enraged, and the possibility of damaging U.S.-China relationship — all before the Chinese government even issued a formal statement on Trump's comments. A sample of the headlines right after Trump's tweet. Taiwanese netizens criticized the international media for being so quick to focus on Beijing's diplomatic line without describing the voices from Taiwan. What we want to express at the end of this article is very simple: The meaning of this phone call is positive, because it provides a chance to re-evaluate the Taiwan-U.S. relationship. […] It's a pity that many mainstream liberal media outlets, including The New York Times and CNN, immediately rushed to warn the world that “this will enrage China” — even before China responded to the incident. Until now, we only saw reports about the responses from Chinese scholars and citizens, and we rarely see reporters interview Taiwanese people about their opinions. 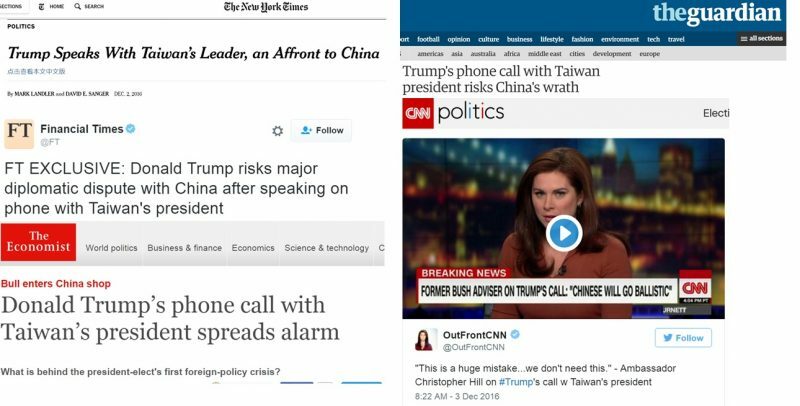 In the end, Beijing reacted as the mass media anticipated, except there was a small twist: the Chinese government's response to the White House was restrained, and they did not even bother arguing with the U.S. President-elected; Instead, they blamed Taiwan for what happened. On Dec. 10, Chinese military aircraft flew over the East China Sea and circled international airspace surrounding Taiwan . In addition to the military threat, the daily Chinese newspaper Global Times suggested that Beijing should punish Taiwan by forcing its allies to break diplomatically. In March, China's pressure led Gambia, a West African nation, to end diplomatic relations with Taiwan and establish formal ties with China, two months after Tsai won Taiwan's presidential election. More recently, China has approached Panama and Vatican . Considering that Taiwan has formal diplomatic ties with just 22 countries, this is definitely not good news. Facing the threat in the military side, diplomatic side, and economic side from China, some Taiwanese expressed panic, but others say they're ready to brave further pressure from Beijing. It is not only today that we face the threat and pressure: we've seen missiles aimed at Taiwanese before. And it is not only today that China does all these bad things to Taiwanese. We don't care if they keep at it. Before this phone call, we were already trapped because of China’s pressure. Now, we're so used to the boiling water that we can actually swim in it, regardless of the temperature. In January, as a warning to Taiwan's newly elected president who is challenging the One-China Principle, Beijing implemented several punitive measures: closing all communication channels with the Taiwanese government, taking steps to weaken the country's diplomatic standing internationally, and discouraging Chinese tourists from visiting Taiwan. Chinese officials also isolated Taiwan by denying its access to the International Civil Aviation Organization summit  in Montreal this September, as well as a meeting of Interpol's General Assembly  in Indonesia a month later. Beijing even engineered the deportation of several Taiwanese citizens traveling in Kenya in this April  and Malaysia in this November. In both instances, those Taiwanese citizens were sent back to China, not Taiwan. Overall speaking, the ‘Status Quo’ between Taiwan and China has been biased toward the China side, especially in the past one year. Therefore, the response of the foreign media to Trump's tweet again represented this imbalance and seemed to Taiwanese to be an insensitive response of international bullying.